Swagerty was a San Clemente California based manufacturing company in the 1950's-70's, and owned by Ancil Swagerty. It's full name was "SWAGERTY Specialties Company, Artistry In Woods". 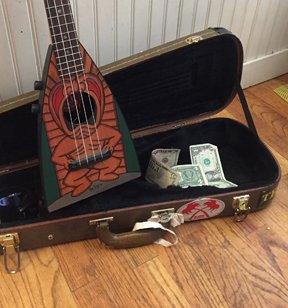 The Swagerty company manufactured many oddball instruments such as the Surf-a-lay-lee the Kook-A-Lele, as well as the "singing" Treholipee. A patent was granted for Treholipee in 1966. Swaggerty had its hay day in the sixties with endorsements from celebrities of the time. Advertisements claimed the Treholipee could be tuned "...as Uke, tenor banjo, plectrum banjo, tenor guitar or baritone uke."!! The Treholipee and the Kook-A-Lele had pointed extended headstocks that, according to advertising materials, allowed the instrument to be stuck into the sand when the surf was up. The Surf-a-lay-lee was shorter, presumably to allow it to be played while on a surfboard, although no mention was made of it being waterproof. It is said that the first instrument was made as a "wall decoration", (Swagerty was a wood worker) and after a friend mentioned that it would not take much to get it playable, the idea was born. Swagerty also made the "Little Guitar". There was also a similar line of instruments called the Polka-lay-lee, and the Wanderlele, made by the Peterson Co, of Ohio.